Isn’t it interesting to listen to what kids have to say? At Todo Math, we think so, and believe that lively conversations with open-ended questions are crucial for building math skills. One way to build those skills is by noticing details that boost our powers of observation. Talking with our kids (instead of just to our kids) about what they notice provides space to share thoughts and ideas. As we approach the new school year, let’s prepare by starting discussions to help kids focus, think and learn! According to math educators, visual math can help kids learn numerical math (Boaler, 2016). When students are able to see math through pictures, it may assist their understanding of math concepts. The world around us is full of interesting pictures. Do we make a point to notice shapes, colors and patterns? Are we curious about how something works? We know from our kids’ constant questions that they are often wondering. As parents, are we wondering along with them. Let’s flex our curiosity by wondering out loud, together! First question: What do you notice? A mother on our Todo Math team is famous for her question, “What do you notice?” She often shares the contents of her coin purse with kids, pours the coins loose on a table, and simply starts with that first question. She isn’t looking for a right or wrong answer. She isn’t asking for a quantification. She is simply asking her child to voice her perceptions. The child may observe any number of things, from the color of the coins, to the noise the coins make, to the way the coins shine under sunlight. Any answers are possible. Her goal is to jointly discuss observations by starting with open-ended questions. Next question: What else do you notice? Our Todo Math mom does not stop there. She deepens the conversation with another question to help kids explore multiple perspectives. “What else do you notice?” she asks. Do the coins look different from the other side of the table? If the coins are moved around, or if you stare at the coins long enough, do other characteristics emerge? Exploring everyday objects can give families plenty of things to notice when they are using super powers of observation! Make it a conversation: Do you want to know what I notice? Kids want to know what parents are thinking, too! “Do you want to know what I notice?”, continues our Todo Math mom. Math skills grow through exploratory conversations. As the school year begins, keep the questions coming. Here is a conversational math activity for the next family breakfast. 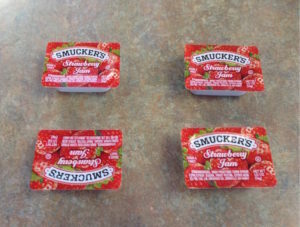 Lay out a set of jam packets on the table. The conversation that follows might include the jam packet size, shape, color, amount, words, or even smell! The child might also notice the detail of one math packet being upside down on the lower left. Maybe the family starts talking about how jam tastes, your favorite jam, how long it’s been sitting on the table in the restaurant, how it might taste on bacon or eggs, or why we put jelly on toast! 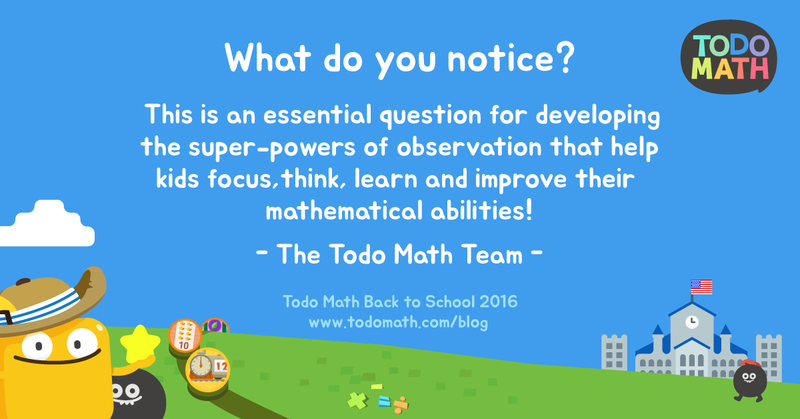 Ask open-ended questions while playing Todo Math! Certain games in Todo Math explore visual connections. The Pattern Game, for example, is ideal for asking kids about what they notice on the screen. Next time your child plays a math game, help them build more math skills by asking open-ended questions about the colors, shapes and objects they see! Our goal at Todo Math is to create tools that meet every child’s learning needs. As parents ourselves, we believe there is a light in every child, and aim to do our best in the quest to help all children learn. Tune into our Back to School 2016 series on early learning success every week in August. Meanwhile, don’t forget to download Todo Math for FREE on the iTunes and Android app stores!